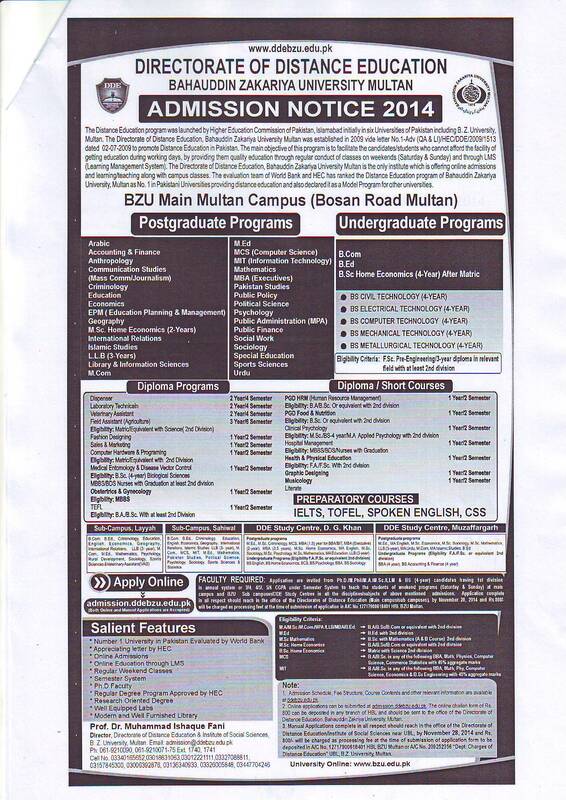 Admission Notice 2014 Postgraduate and Undergraduate Directorate of Distance Education BZU. The Distance Education program was launched by Higher Education Commission of Pakistan, Islamabad initially in six Universities of Pakistan including BZ University Multan. The Directorate of Distance Education Bahauddin Zakariya University Multan was established in 2009 vide letter No.1-Adv (QA& Li)/HEC/DDE/2009/1513 ‘ dated 02-07-2009 to promote Distance Education in Pakistan. The main objective of this program is to facilitate the candidates/students who cannot the facility of getting education during working days, by providing them quality education through regular conduct of classes on weekends (Saturday and Sunday) and through LMS (Learning Management System). The directorate of distance education, BZU Multan is the only institute which is offering online admissions and learning/teaching along with campus classes. The evaluation team of World Bank and HEC has ranked the distance education program of BZU Multan as no.1 in Pakistani universities providing distance education and also declared it as a model program for other university.